If you have any questions or suggestions you are welcome to join our forum discussion about The Trend – a Trader’s Best Friend. As we said earlier, technical analysis is based on several assumptions and one of them is, that global markets do trend. Usually market players hope to purchase an instrument at the start of an upward trend at a low price, follow the trend and then sell the instrument when the trend ends at a high price. Sounds simple, but to achieve it in a dynamic market has become quite complex. That is so, because the determination of a trend and a possible trend reversal is, in many cases, a subjective decision, which relies on both skills and experience in the Forex market a trader possesses and his/her ability to control his/her emotions. All investors make mistakes, but professionals know how to rectify theirs in a timely manner. A trend defines a direction in market prices. When we refer to a trend, we mean a directional trend (formed by rising or declining prices), from which a trader can generate a profit, if using an appropriate trend-following method. A rising trend (uptrend) is formed, when prices reach higher peaks and higher troughs. A decreasing trend (downtrend) is formed, when prices reach lower peaks and lower troughs. A sideways trend (flat trend) occurs, when prices tend to trade in a specific range without demonstrating a significant upward or downward movement, they move up and down, but remain at approximately the same level. This configuration occurs after a larger trend has reached a temporary halt. A flat trend is also called a consolidation or congestion area. It is vital to mention that trend-following methods show good results only during uptrends and downtrends, but they do not work properly in non-trending markets. 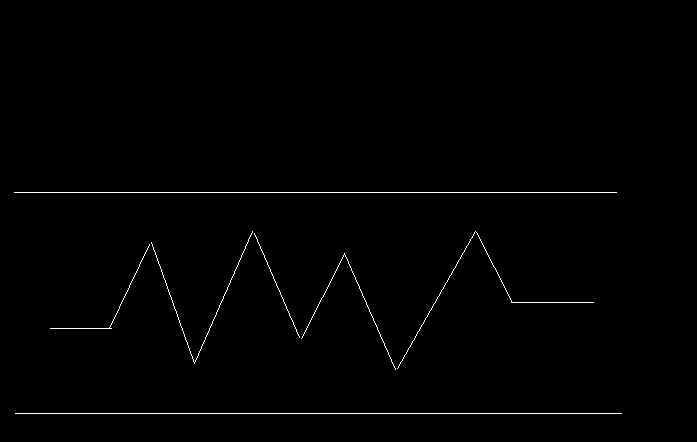 In order to deal with sideways trends, most technical analysts use price oscillators. We shall examine these techniques at a later stage. In strategic terms, an investor, who relies on technical analysis must decide: first, when to enter a position, and second, when to exit the market. Exiting a position, however, is comprised by two decisions. The investor must decide when to exit a position in order to lock-in a profit, when prices move in the expected direction. And also, he/she must decide when to exit a position at a loss, when prices move in the opposite direction from what was anticipated. Every trader needs to be aware that the actual trend might differ from what he/she expected. Therefore, deciding at what price level to sell and reduce losses before entering into a position is a way to protect against huge losses. In order to profit with the help of technical indicators every trader should have in mind that he/she must follow the trend, control risk of loss and avoid risk of ruin. How can we identify a trend? It is useful to say that price action does not follow a continuous, uninterrupted line. Sometimes small countertrend movements within a trend could make the actual trend hard to identify. In addition, as trends have different lengths, shorter-term trends are parts of longer-term trends. For a technical analyst, a trend is a directional movement of prices, which remains valid long enough so that it could be identified and still be playable. 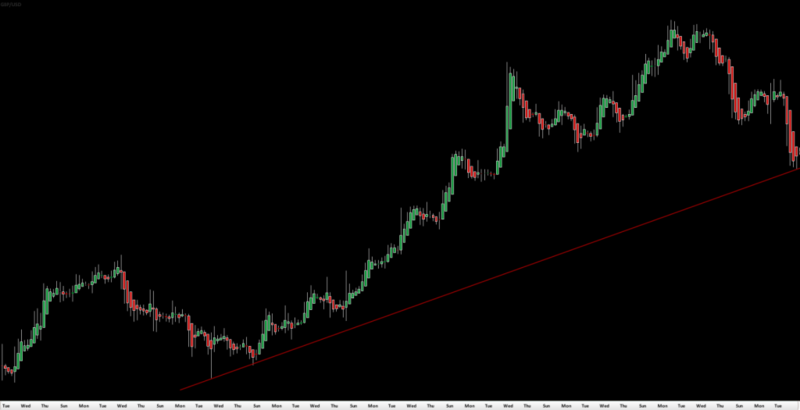 A trend should be identified as early as possible and be long enough so that a technical analyst can profit from it. Some analysts prefer to use moving averages to smooth out shorter trends within the trend of interest and identify the longer-term trends. Another method to identify trends is to examine a graph of prices, looking for extreme points (peaks and bottoms), which are separated by certain periods of time, and then, draw lines between these points. These lines are the so called trend lines. 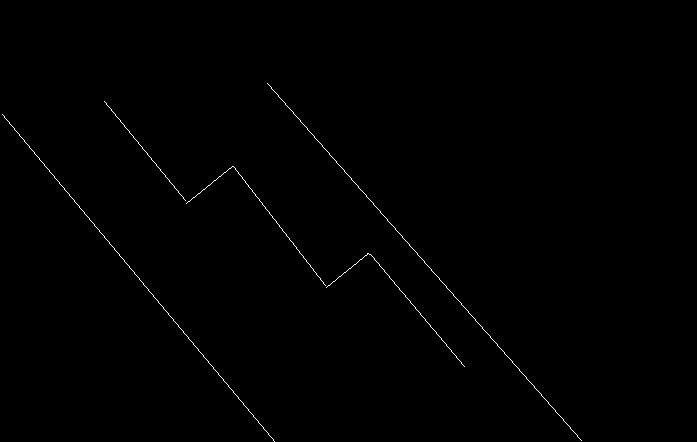 By drawing lines between extremes, top to top and bottom to bottom, a trader gets an idea of price direction and its limits. 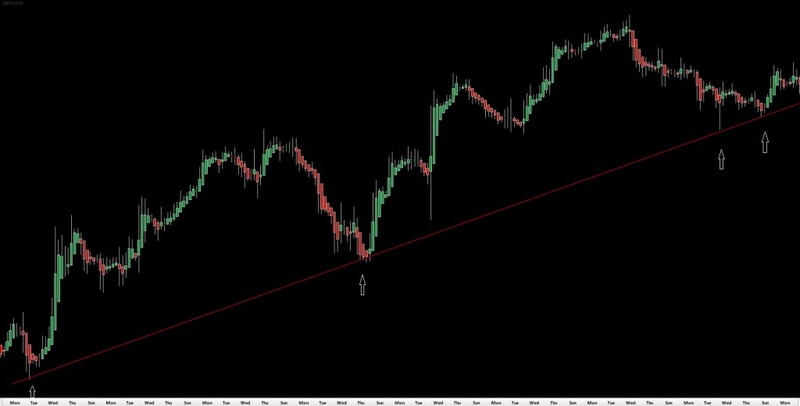 Trend lines are used to determine limits to price action, which, if broken, can signal that the trend may be reversing. 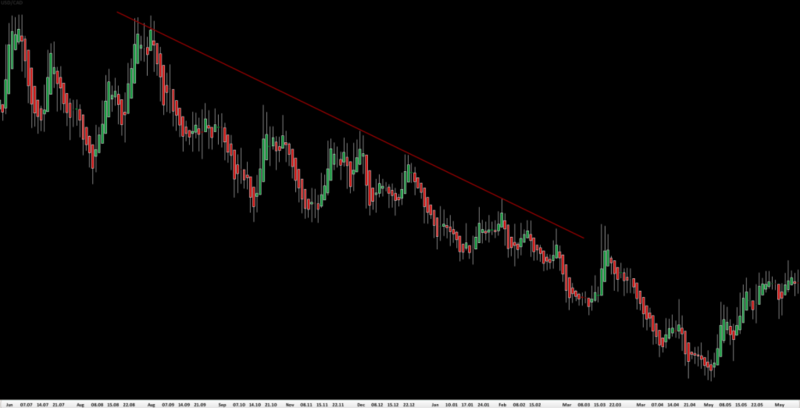 When drawing trend lines during a downtrend, they are usually drawn above price action. 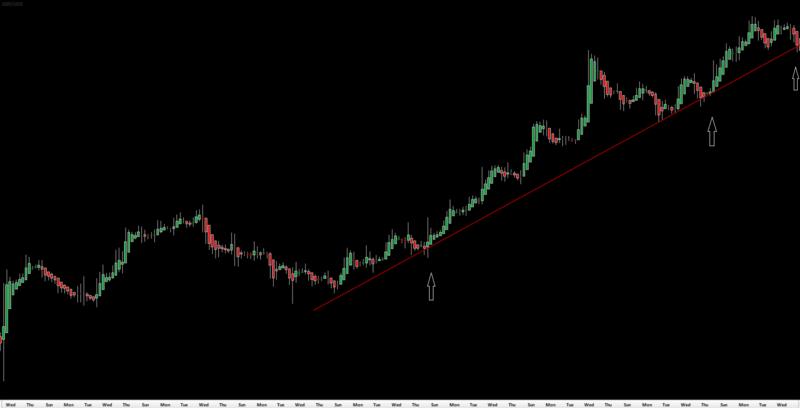 When drawing trend lines during an uptrend, they are usually drawn below price action. 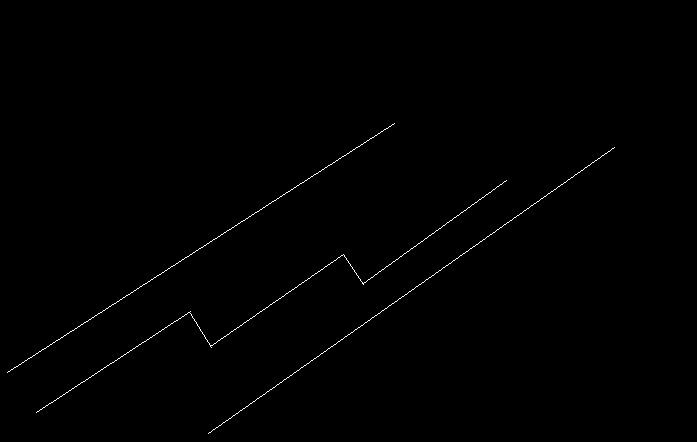 A trend line is determined by highs (peaks) during a downtrend and by lows (bottoms) during an uptrend. At least two swing highs and two swing lows are needed in order to draw a trend line. But, for a trend line to be valid, at least three peaks or three bottoms are to be used. When drawing trend lines some traders prefer to use the bodies of the candlesticks, while others prefer the wicks of the candlesticks. Either method is acceptable. Charles Dow was one of the first of the modern technicians to state the fact that market prices trade in trends. According to Dow, traders should concentrate on the time horizon, which suits the most their preferences. The theory states that all trends are fractal, which means that their behavior is the same regardless of the time frame. Minute-to-minute trends demonstrate exactly the same behavior like day-to-day trends, with only minor differences because of the variation in liquidity over the shorter time periods. Dow suggested that there were three principal time horizons: the primary, the intermediate and the minor, which he compared to tides, waves and ripples. Another crucial observation was that trends tend to continue rather than reverse. If it was otherwise, there would not be a trend and the latter could not be used for profit. 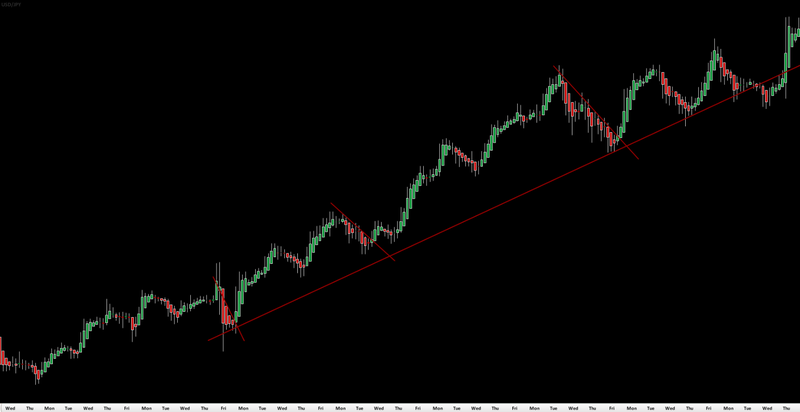 Last but not least, according to Dow, every trend is influenced by its next larger and next smaller trend. Within the uptrend there are many smaller trends (up and down), which, on their part, are comprised by even smaller uptrends and downtrends. This again underscores the fractal nature of trends. The longer trends usually influence the strength of the particular trend (the trend of interest), while the shorter trends will often produce early signs that the longer trends could be reversing. On the following graph we visualize a large (major trend) with a number of small trends within it. Shorter-term trends tend to reverse before medium-term, while medium-term trends tend to reverse before long-term.